Gamer hype is not uncommon, and 7 Wonders, even before its many official accolades (including the first-ever Kennerspiel des Jahres), has been a particular geek darling. Copies last fall were hard to track down, and the hype continued to be laid on thick. (I suspect some of this was an indirect geek brag: “Not only is this game awesome, but I have a copy and you don’t.”) Still, a seven-player game that could be played in half an hour, produced interesting decisions, and allowed strategic planning seemed far-fetched, and I was sure the hype could not be true. After a geek super-couponing deal at Barnes & Noble that any frugal mom would be proud of, I secured a copy of 7 Wonders (for less than $2 out-of-pocket, I might add /geekbrag). What do I think about it? Find out below! 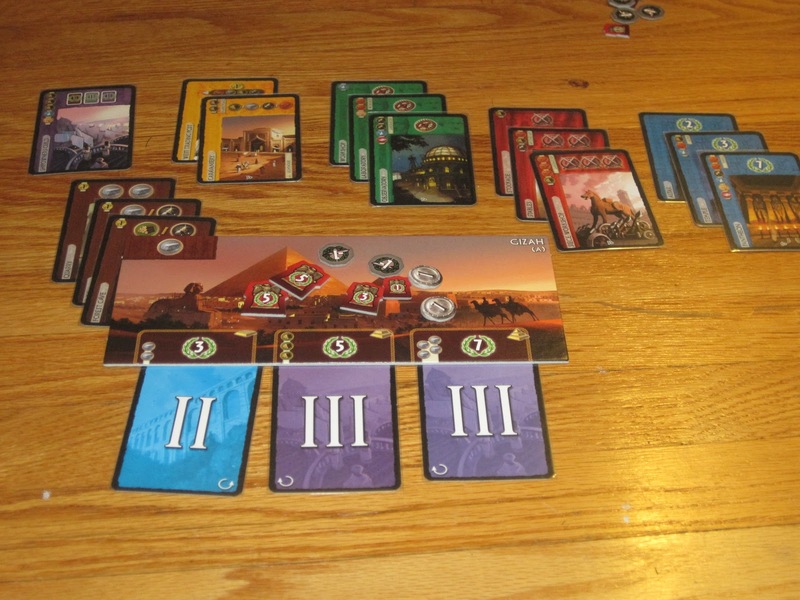 7 Wonders is a card-drafting civilization game played over the course of three ages. The goal of the game is to end the game with the most victory points, representing advances in civilization. At the start of the game, each player is dealt a civilization they will build. Their civilization is represented by a board that bears a picture of that civilization’s wonder. Similar to the starting worlds in Race for the Galaxy, each wonder provides resources and benefits that can nudge players in a strategic direction. At the start of an age, cards are dealt into packs of seven for each of the players. Players take up their pack of seven and play begins. Each age is comprised of six rounds, and at the end of the age, players resolve military conflict. By the way, I use the term “round” rather than “turn” because play is simultaneous; all the players make their decisions at the same time rather than by taking discrete turns. During each round, every player will choose one card to play in one of three ways: the card may be played face-up in front of the player (by paying its resource cost), face-down as part of the player’s wonder (by paying the cost listed on the player’s wonder board), or face-down to the center of the table (discarded to receive three coins). Once each player has selected a card to play, players simultaneously play their cards. Then players pass the pack of cards they drew from to the left or right (depending on the age) and choose a card from this next pack of cards, and so on. Once players receive packs that have only two cards, they choose one and discard the last. This ends the age. At the end of the age, players compare their military (shield symbols) with the militaries of the players to their immediate right and left. They lose one victory point for each defeat and gain victory points for each win. (Points for military victories increase in the later ages.) Then the next age cards are dealt, and players begin the process again, this time passing in the other direction. The variety of card types. The cards come in seven types: civilian structures (blue; these are straight VPs), scientific structures (green; these are worth points by set collection), raw materials (brown; simple resources like clay, wood, and stone), manufactured goods (gray; things like papyrus, textile, and glass), military structures (red), commercial structures (yellow; these make resources easier to acquire and later in the game offer victory points), and guilds (purple; these are only available in the third age and provide victory points based on certain conditions; they generally reward specific strategies). The cards are mostly wordless, using a system of iconography similar to Race for the Galaxy (though, in my opinion, more easily discernible). 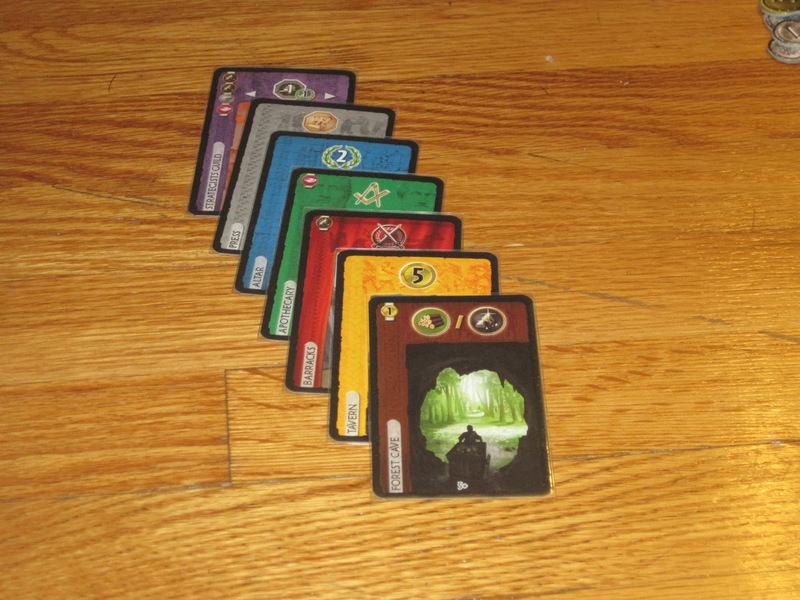 Players accumulate resources in 7 Wonders differently than in, say, Settlers of Catan. A player does not pay resources that go away in order to play cards. Rather, the resources “produce” each round. Similarly, players may “trade” with the players on their immediate right or left by paying them two coins for each resource they use. Trading resources does not preclude the producing players from using the resources themselves, but it does give them cash either to use others’ resources or to bank as victory points at the end of the game. 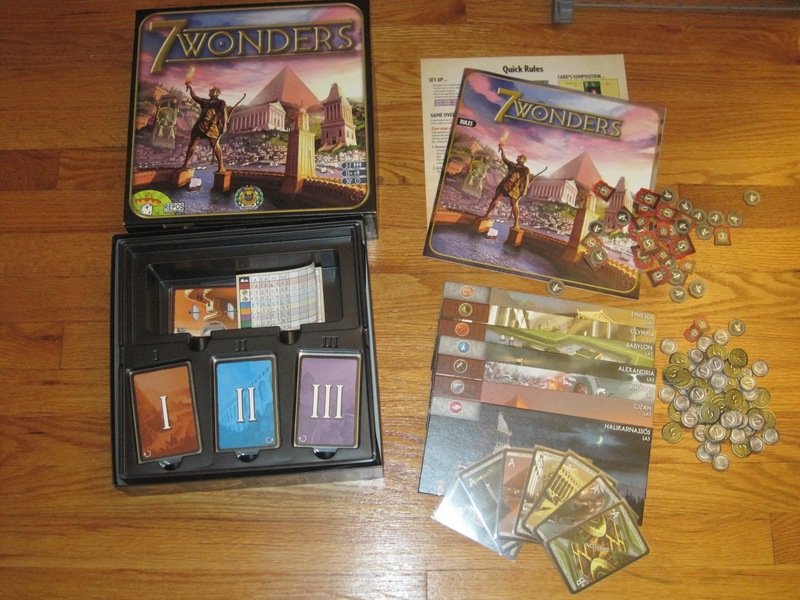 Does 7 Wonders live up to the hype? I’m not sure any game could live up to the hype that 7 Wonders has received, but it is a fantastic game and one I’m always willing (and often itching) to play. As a long-time CCG player who was never able to take part in a booster draft, 7 Wonders fills a special void in my gaming heart. Each round produces lots of tension and interesting decisions because any cards I don’t choose are cards that the next person in line might play. I can only remove one card from the pack before passing, so the game is a delicate balance between choosing the card that will best help me and not passing a card that my opponent desperately needs. A full civilization. Gorgeous components, huh? The game is balanced well, and there are multiple legitimate paths to victory. In the last round, there are several different cards that give you victory points for things, even resources that you have available. The only thing we’ve noticed in our group is that new players tend to avoid the blue cards (which are straight-up victory points), probably because they see them as a trick. Not only does this keep them from these points, but it skews the game in favor of those who will take the blue cards, leading to some runaway victories. As players get more experienced, their selections become more balanced, but this might be something to warn new players about. Another thing to love about the game is the components. The artwork is beautiful. The game has one of the best and most consistent designs out there. The icons are helpful, the cards help newbies (and seasoned veterans) see which cards they aid in building in the next age, and the game is just pretty to look at when one of the people at the table spends too long taking his turn. The coins used to track money, the tokens that mark military victories and defeats, and the wonders are all on thick cardboard that can stand up to many plays. The scorepad included is a great way to ease the burden of counting up points and is a good guide to make sure new players get all the points they’re entitled to. The only thing I would caution you about as far as the components are concerned is that the cards are very easy to get marked. Because the game is particular in what cards are used for which games, the cards that are used in the three-player game see a lot more use (because they are included in every game) than the 7+ player cards (which are rarely used, at least in my circle). I highly recommend sleeves. The Mayday premium sleeves are fantastic for this (I recommend splurging on the premium sleeves; the art is worth the protection). 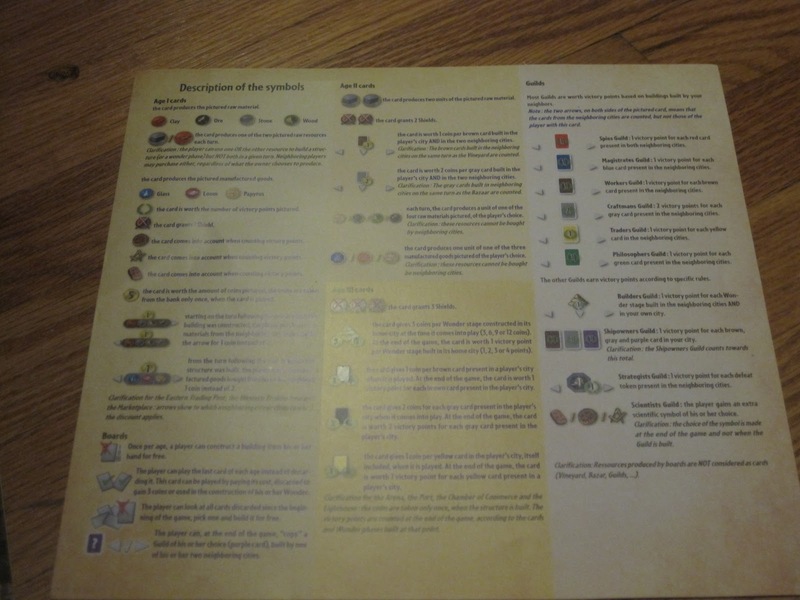 The icon cheat sheet…which I keep away from new players. Mwahahahahahaha! The game is easy to play once players get adjusted to it, but it is surprising how hard it is to teach. Players look at the icons and are intimidated, but I’m also reluctant to pass around the icon cheat sheet as I think it gives players an unnecessary crutch; normally they understand what they’re doing after the first age, and to allow players to look at the sheet for each card slows things down considerably. Usually by the end of the first game, new players can recognize things they could have done better and are ready to try again. And with the short game time, this usually isn’t a problem; it’s just something to watch out for. 7 Wonders is a game I enjoy because it is nearly flawless in its execution for what it is. It’s not a game that I’d want to play several times in a row, but it is a game that I want to play often as it is easy to get going and play quickly while still offering good decisions. It scales well from three players to seven (I don’t care for the two-player variant) and is generally a crowd pleaser. It may not live up to the monumental hype, but it’s certainly worth your consideration. My favorite thing about 7 Wonders is definitely the “everybody plays at the same time” shtick, and that it works well. It can get frustrating in other games waiting for six other players to each decide what they’re going to play, one at time, until it finally comes back to your turn. In 7 Wonders, you only have to wait for as long as the slowest player takes—and then, only the extra time after you finish deciding your plan. 7 Wonders isn’t the deepest civilization-building game out there. But despite its short playtime and its very simple mechanics, it offers a lot of choice and strategy. You definitely need at least one playthrough before you can really grasp how the game functions as a whole, but it usually only takes that one playthrough before new players become competitive. There are a variety of strategies that work, so you don’t have to play the same way each time and hope you get lucky, and the best strategy is usually playing a mix of cards. There are a few misleading ones though—new players often pursue military and ignore blue cards, when in reality military can only grant you at the most 18 points, while blue cards can get you upwards of 30 or 40. I also like that everyone is always in the game the whole time. You can always drop a card for money, or pay your neighbors for resources you don’t have. Cards that can be built directly with earlier cards allows for some strategic planning with placing resources versus setting up a string of cards that lead to a new card each time. You can’t really get boxed in, since the player before you can only take away one card, leaving you a wealth of options. This is a great insert. The game does have a lot of icons, but they don’t have complicated interactions. That is to say, it may look complicated at first glance, but once you get used to the resources that are available and the resources that are required, it’s not hard to figure out. The most confusing part is cards that have arrows and award bonuses based on what either you or the players to your right or left (or a combination of two or even all three) have down in front of them. You will likely have new players showing one of the cards in their hand in the third age to ask what it means the first time they play. There are seven different civilizations, but honestly, they don’t change up the strategy all that much. All in all, 7 Wonders is a very solid gaming experience. If it has any flaw, I would say that it’s slightly imbalanced in which cards award the most points. You can really rack up points with green cards, but that can be heavily diverted if someone removes even one or two green cards from the mix. You can really rack up points with blue cards, and that can only be stopped if everyone plays a few. Military is more limited even if it seems attractive (in fact, I’ve won many games by completely ignoring military), and certain purple and yellow cards can be quite valuable…but it all depends on what the adjacent players have played. They might be worth a little to one person, and a whole lot to another. Suffice to say, certain card types definitely carry more weight than others. But then that’s part of the game – you have to pay attention to what your neighbors are doing and playing, from the resources they make available to the sets of cards they put in front of them. 7 Wonders is a fast-paced, easy-to-learn game that is fun and strategic without being too intense. It would be a good family game, and it doesn’t require too much patience since everyone chooses their next card at the same time. It’s definitely worth a good look. Want another opinion? Check out @BGJosh’s 7 Wonders review, The Board Game Family’s review of 7 Wonders, or the 7 Wonders review on Play Board Games. 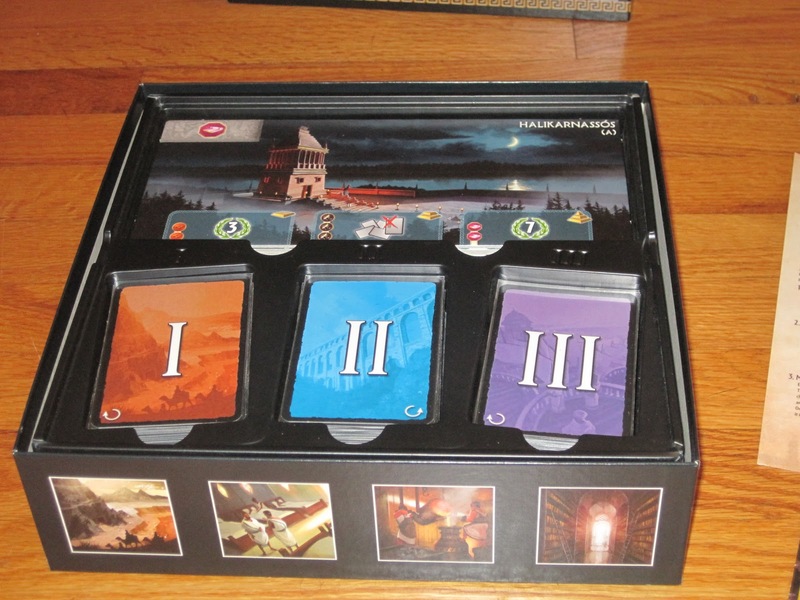 Next Article [Ended] FDQ: Do You Want to Win a Copy of Dominion: Hinterlands?